The first wishlist service to be included in our new wishlist review table is the Wishlist ('lahjalista' in Finnish) service from Sokos, one of the big Finnish department store chains. This in not the biggest or greatest giftlist service in the world, but it is the first one that I stumbled on and used 17 years ago. And as it still exists, it must have done something right... or just provided one more proof that wishlists in general are useful :). So, to honor the wishlist service that was the first one I used, I will make it the first one to add in our comparison table. The sokos wishlist / giftlist service can be found in two different ways. First, you can browse their web shop and see the small heart icon that can be used to add items to your wishlist. 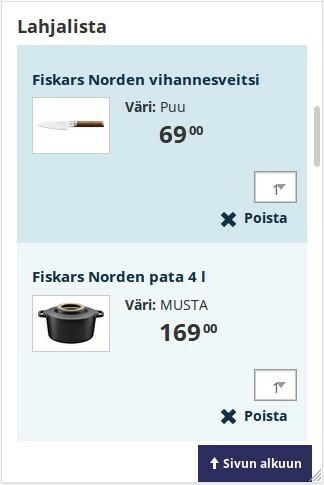 The other way to find the service is the top menu of the site, by selecting the services ('palvelut') menu item. Sokos provides a possiblity to make several giftlists. You can also add extra information to the giftlist, such as event day and description. There is also a text field where you can add items not found at Sokos. Naturally, such items cannot be tracked for purchase, and you cannot enter very much information in the field. This doesn't qualify for our 'wishes from anywhere' check mark, and since non-Sokos items are not really supported, they don't provide a bookmarklet for it either. Sokos has mobile pages and they work quite well. There would still be plenty of room for improvement in general (as there is so much stuff on the screen) and especially regarding wishlists and giftlists. For example, some of the controls that can be used to move between your wishlist and giftlist will disappear in the mobile screen, which makes it much harder to use the service. It is clear that the wishlist / giftlist part is not a focus area. No check mark for a dedicated list. Sokos don't have mobile app, so no point from that either. The service is provided only in the Finnish language, so no multilingual check mark. Only one authentication method is provided, so no check mark there, either. Their giftlist does not provide a 'surprise me' functionality, so if you want to maintain an element of surprise, better not to go add items to your list once you have shared it. The list does not provide support for communication in the event / gift context or support group purchases in any way, so no check mark for that. The GUI is responsive, so a check mark for 'modern gui'. This ends our first review, for the wishlist / giftlist service that Sokos is offering. I hope you got a good idea of the what the service can do. In case I have missed something, please comment on this post, and I will look at it! and here at the bottom there are two links to the instructions (in Finnish) on how to use the Sokos wishlist / giftlist service.